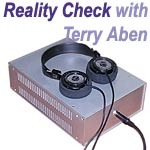 "My headphone amp, which I have dubbed the Aleph H, is simply a scaled-down version of Nelson Pass' Aleph amplifier series. Nelson Pass has made the unbelievably generous donation to the DIY world of making public the service manuals to all of his designs once they are out of production - and he actively participates online on the Pass Labs Forum at DIY Audio helping hobbyists like myself with our creations. Nelson's single requirement is that we restrict the use of his intellectual property to the creation of products for our own personal use. If you want to contact me looking to buy an Aleph H, go ahead but be aware that I'll have to make some sort of licensing arrangement with Mr. Pass first, assuming of course that he's amenable to the idea. The Aleph H circuit topology is identical to a Pass Aleph 3 with the exception of substituting a pair of lower power IRF610 MOSFET transistors for the 4 larger IRF244s and adjusting several resistor values to set the proper operating parameters of voltage and bias within the circuit. The Aleph H swings a maximum output of 14V and 0.5A compared to the Aleph 3's stats of 23V and 8A. I must also point out that like most DIYers, I had some help along the way of creating this amplifier. First, Marcello Pellerano modified the Pass Zen amplifier to create a Zen headphone amp, which he documented at headwize.com and diyaudio.com. Also, 'Grey' Rollins from diyaudio.com created a scaled-down version of the Aleph amplifier, which he called the mini-A intended as a low-wattage speaker amplifier. Next, jwb from diyaudio.com modified the Aleph circuit to produce a headphone amplifier that substituted JFETs for the MOSFETs in the input stage. I studied these design extensively in preparing for my amplifier. Also common within the DIY world are group buys where a collection of people organize to buy parts at bulk pricing. BrianGT from diyaudio.com produced generic Aleph circuit and power supply pcb designs that could be used to create several of the Pass Aleph amplifier variants and organized a group buy for them to be manufactured. I participated in this group buy and used these boards for my Aleph H. For most of my creations, I built the circuits on perf board but when good quality PCBs are available, they are much easier to work with. So, while I had to do some circuit design work to come up with my exact version, I "stood upon the shoulders of giants" as the saying goes. The best thing about DIY is that you get to build exactly what you want or need without any concessions to factors like market demands, cost margins and competitors' feature sets that commercial audio companies must consider. A relevant example is my omission of a volume control, quite unusual in comparison to the commercial market offerings of headphone amps and one I should explain. In my case I only have two source components, a CD player and an iPod. When using the headphone amp with my iPod, the iPod volume control can't be defeated, making another volume pot a redundant component in the signal path. My preamp has a set of balanced and single-ended outputs that are selectable from the front panel. I am currently on a prolonged journey of exploring speaker amplifiers of balanced configurations, leaving the single-ended output available for connection to the headphone amp - again making a volume pot in the headphone amp redundant and saving me the trouble of rummaging behind my main system to reroute interconnects whenever I want to do a bit of headphone listening. Therefore, my headphone amp doesn't have a volume control. Adding one is as simple as a single stereo pot. To go along with this approach, the amp is designed with unity gain, achieved by a resistive input network to avoid increasing the level of feedback used in the circuit. Similarly, the amplification circuit will accept a balanced input as well and simply needs the addition of the XLR connectors to make it so. I believe strongly in the concept of the power supply being the heart of any audio electronics component. 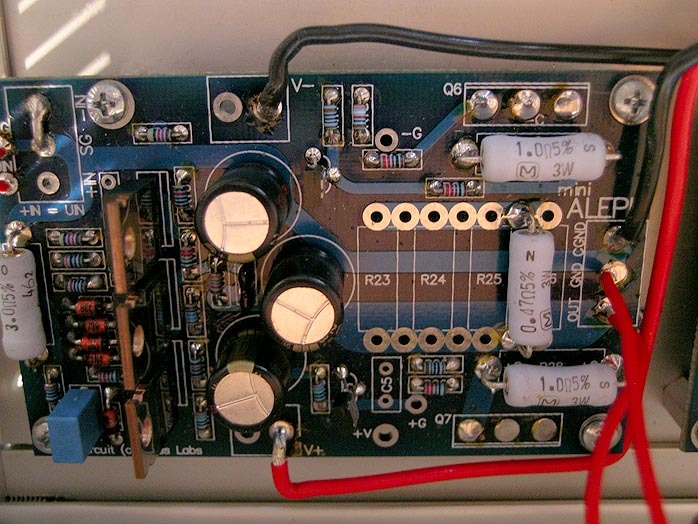 Without a top-level power supply, the rest of the circuitry doesn't come to life. In a headphone amplifier, the power supply is even more critical as headphones have an enormous sensitivity compared to loudspeakers: ~90dB/mW compared to ~90dB/W. If you want a headphone amp to have a silent background, the power supply needs serious attention (60dB more noise attenuation than a power amp supply). 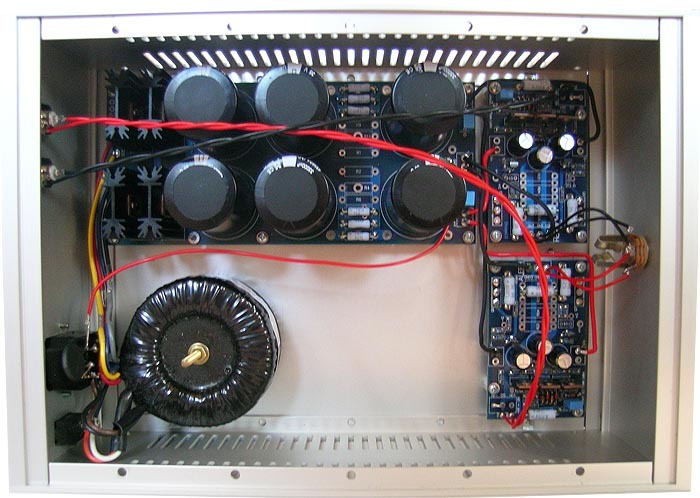 There are many approaches to building good power supplies. The common route for headphone amp design uses voltage regulation in the supply because it can be built relatively compact and because it works well at eliminating the voltage ripple that occurs from rectifying AC to DC. But voltage regulation circuits suffer from the same limitations as amplifier circuits - achieving wide frequency bandwidth requires a sophisticated approach. As RF and EMF noise occur at much higher frequencies than the rectification ripple, a truly good regulated supply design requires much more than the ubiquitous IC regulator chips. Just ask Walt Jung. The other tricky issue is producing a regulator that doesn't curtail the dynamic response of the supply. Designing a regulator stage with wide bandwidth and unlimited dynamic response can be done, just be prepared to invest some serious time getting it right. I decided to take the route less traveled for my amp, following what Nelson Pass once humorously referred to as "the big dumb approach", omitted regulation and using capacitance, capacitance and more capacitance instead to filter the noise. I figured that I could always add a regulation stage if I felt one was needed. How much capacitance, you ask? 0.2 Farads, that's how much! Substantially more filter capacitance than you will find in all but a handful of elite audiophile power amplifiers. Why so much? Because this is DIY. I did it because I could, that's why! Furthermore, I arranged the capacitance in a CRC pi filter that further improves the noise rejection by an order of magnitude and added polypropylene film bypass capacitors to assist with high frequency noise. Lastly, I used a transformer rated at several times the power requirement of the amp. My goal was a power supply completely unaffected by any demand ever required and I like to think that I was successful. According to my measurements and calculations, the power supply related noise level should be below the limit of human hearing with any pair of headphones. With the exception of the clearly excessive power supply configuration and the general circuit design, there is little in the Aleph H that would be considered "audiophile". The resistors are all run-of-the-mill Phoenix metal film or Panasonic metal oxide types. The capacitors are Panasonic electrolytic and polypropylene film types with the exception of a single silver-mica cap per channel. The only parts that would be considered audiophile are the ultrafast soft recovery diodes used for rectification in the power supply, the DH Labs wire and the Cardas RCA jacks and solder. Would better parts make a difference? I don't know yet because I haven't tried it. Whether I change that will probably depend to a large extent on what Srajan has to say in his review. If for any reason the fuse blows, it can be replaced with any slo-blo type between 2 and 5 amps rating. The chassis is directly grounded and the circuitry connected to ground via thermistor so it meets safety requirements."